February is a good month. I got my hands on a Justimon, Saint Gargomon and Dukemon D-Real figure. This is a review of Saint Gargom. 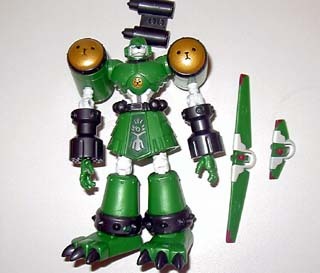 Saint Gargomon comes packaged with two heads, a detacheable jet pack and a Saint Gargomon playing card. Saint Gargomon seems to be very very big, but he's not much bigger than the other D-Reals. Once again Bandai went out of their way to make him detailed. 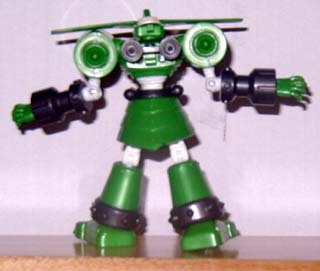 He looks like a giant robot, right down to the detailed paint. 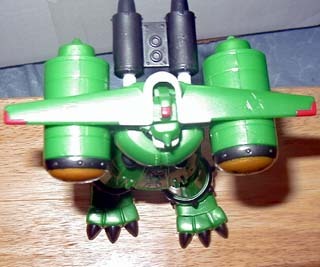 All of his missiles are painted yellow with a face, even the small one in his chest. His belt buckle is even two different colors. 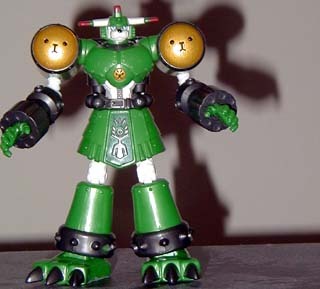 Saint Gargomon is not as transformeable as the other D-Reals. Instead he has a removeable head/ear. You can switch him from Normal Mode to Flight Mode by switching shorter ears for a longer pair. You just take the top of his head off, put a new head on, rotate his jetpack and boom. Saint Gargomon is ready to fly! Saint Gargomon's joints are limited due to his bulk. His arms can move up or down 360 degrees. His elbows are double jointed. His wrists can also spin 360 degrees. His waist is stiff, but it can also turn around completely. 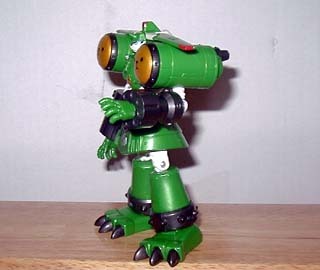 His legs can move up or down slightly, but they are double jointed so they can also swing sideways. His knees are double jointed. His ankles can pivot. Finally his head can turn around. 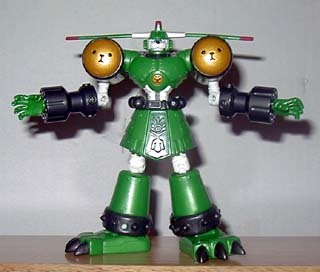 Saint Gargomon is neither as detailed as Justimon or faithful as Dukemon, but he still looks great. I have Gargomon and Rapidmon as well, and the three of them standing side by side looks very good. Saint Gargomon is not perfect. 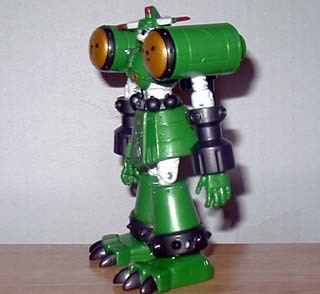 He is the least poseable of the D-Real figures, which is a problem that all of Terriermon's evolutions have. Because of his huge skirt, his legs cannot kick out like they can in the cartoon. And because his shoulders are so big, you can't move his arms without having them hit his ears. Also his shoulder rockets do NOT come out. They are stuck in the shoulders. Finally, his face is the wrong color. It should be a pale yellow, not white. 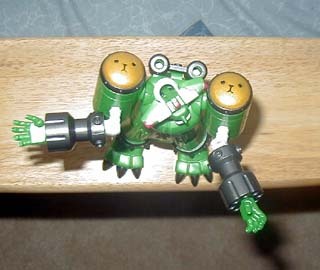 Saint Gargomon's Head - Flight Mode. Saint Gargomon's Head - Normal Mode. Saint Gargomon's Back - Flight Mode. Not as many removeable parts as other D-Reals. The face is the wrong color. Pretty cool. I hear the American version does NOT have replacement ears, which is pretty stupid once again.